In honor of the Spring Equinox I am going to talk about the ritual uses of eggs and egg decorating, but before I can get into that I must tell you the history and symbolism of our friend, the humble chicken. The chicken was first domesticated in Southern China 8,000 to 10,000 years ago. Chickens are part of the avian family Phasianidae which includes other domestic birds such as pheasants, peafowl(peacocks), and turkeys. All of these birds have important spiritual symbolism the world over, but the chicken is particularly special. The female chicken or “hen” ovulates nearly once every day, even when her eggs are not fertilized by a male. Chickens are also communal animals who share nests and nest on the ground. 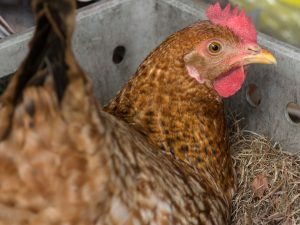 To make a chicken lay an egg where you want it to all you must do is place an egg-shaped rock or ball in a prepared nesting spot that is safe from rain and snow. Unfertilized chicken eggs are quite nutritious, as the yolk contains all the necessary proteins to feed a chicken fetus. Feeding and caring for chickens is quite simple, since when they are allowed to roam they scavenge for food themselves, often eating scraps humans and other mammals leave behind. Chickens are truly amazing animals because, as my partner once put it: “you put trash in one end and food comes out the other.” Because of this, many researchers have noted that chickens could easily make a dent in world hunger. The abundant nature of the chicken was not lost upon ancient peoples, either. The chicken’s popularity as a farm animal, and the practice of bird domestication, spread all over Southeast Asia for thousands of years and the practice of chicken domestication and breeding became more refined. East Asian explorers and nomads traded these benevolent birds with all the cultures they came into contact with. It is possible that Polynesian explorers first brought the Araucana Chicken to South America, though some people reject that theory. The fact is, even the Spanish colonists in Chile believed that the Araucana is of pre-Columbian origin, and there is plenty of evidence for Polynesian and Chinese sea trade with the native inhabitants of South and Central America centuries before the Spanish ever arrived. Chickens and other domestic Asian fowl arrived in the Middle and Near East and Europe via nomads and traders along the Silk Road, and Phoenician and Egyptian sea traders millennia before the founding of Rome. One Ptolemaic writer described the chicken as “a miraculous bird who gives birth once a day.” These miraculous birds and their eggs found their way into the symbolism and rituals of many cultures all over the world. In the chicken’s home country of China, the Rooster is one of the Zodiac signs in their astrology. It is here where the rooster first gets its association with punctuality, as the rooster’s crowing wakes the farmer up before dawn so he can tend the fields before the sunlight becomes too punishing. This trope gets carried into Western symbolism as well. In China, as well as ancient Rome, Egypt, and Greece the rooster also symbolized competitiveness and bravery. Themistocles of Athens said of two roosters fighting: “Behold, these do not fight for their household gods, for the monuments of their ancestors, for glory, for liberty or the safety of their children, but only because one will not give way to the other.” Chickens were used as a form of divination, and cockfights especially for augury on the outcome of an upcoming battle, all over the Mediterranean. Ghosts are banished by a rooster’s crowing Chinese folk tales, since it warns of the coming of daylight in which ghosts cannot roam. Because of their link with the sunrise, chickens are also, in China and elsewhere, symbols of the sun god. China is also where chickens initially became associated with luck and prosperity, due to their ability to reproduce so quickly and easily feed an entire family with their eggs and meat. Chickens are also associated with luck because, according to Chinese legend, they were related to the the phoenix prior to domestication. (This legend is also attributed to their cousin the peacock in some cultures.) Hens are noted in many cultures for their nurturing and maternal nature. Hens will even nest on ontop of other animal’s babies, such as kittens, to keep them warm during storms. Chickens start to lay eggs again after the Winter Solstice when the days finally start getting longer again since chickens only lay eggs during sunlight hours. Their fertility really picks up around the Spring Equinox when the daylight hours finally are equal to, and afterwards become greater than, the nighttime hours. The longest egg-laying day of the year is the Summer Solstice, but most of the eggs hatch in spring and early summer. This further reinforces the connection between chickens and solar deities. 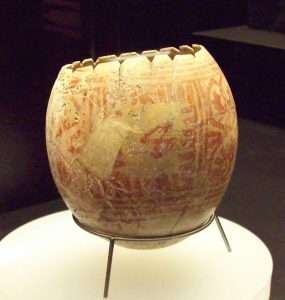 Egg painting likely started in Asia, but its exact regional origins are not certain. Egg carving started in Africa as long as 60,000 years ago. 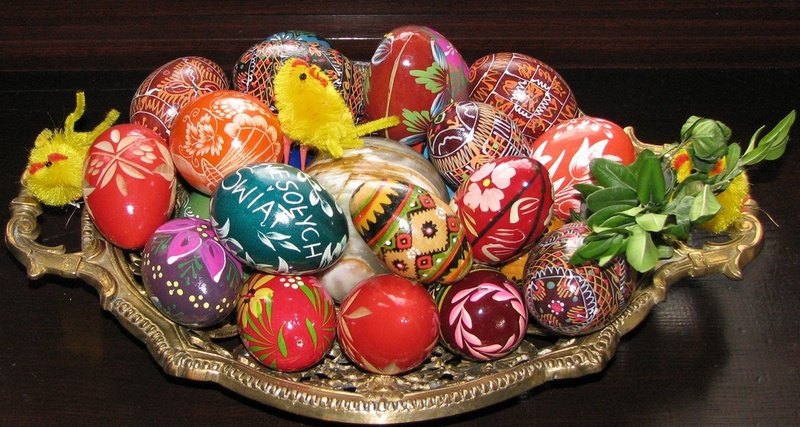 Egg decorating has been a custom from Southeast Asia to as far West as Persia for thousands of years. 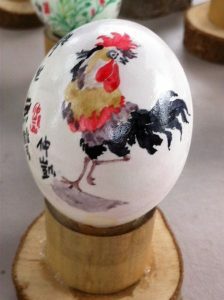 In China a dyed-red, painted, and/or carved eggs were given as wedding gifts for luck and fertility. The Zoroastrian New Year, which is the Spring Equinox, is celebrated by dying eggs. This holiday, called Nowruz, is still celebrated by Muslims in many countries. Not surprisingly, Nowruz is also celebrated in the Xinjiang Uyghur Autonomous Region of China. Egg decorating is also a spring ritual in Egypt called Sham el-Nessim, which is celebrated by many Egyptians of all religions. Both Nowruz and Sham el-Nessim are largely considered secular and cultural holidays, as opposed to religious. Both however, have ties to Babylonian and Egyptian spring festivals. 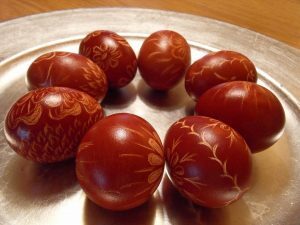 Some Jewish families of the Mediterranean and Eastern Europe practice a tradition of dying eggs red with onion skins for Passover, though Passover does not land on the Equinox (but the first full moon after it), it is a springtime holiday. Onion skins are actually one of the oldest sources of red dye, and have been used to dye eggs in many of the cultures I have listed above. Red, in fact, remains one of the traditional colors for eggs to be dyed during all of these springtime celebrations. This few thousand year old tradition of springtime egg decoration was absorbed into the Christian Easter festival. So what are some of the ritual and spell uses for eggs? Springtime offerings to ancestors who liked eggs, or were from a culture that celebrated egg decorating. You can also charge an egg with a spell, sigil, or intent, and then eat it to “gain” the ability you enchanted the egg for. You can give a chthonic/underworld spirit an egg or eggs in exchange for a familiar spirit (just a spirit, not a living animal), since the egg contains the nutrients to make a new life. You can take a cleansing bath with a whole, unbroken egg in it to absorb bad luck, a curse, or negative energy that has been placed upon you. (This is how to counteract the egg-smashing curse as well.) Throw the egg away when you are done. You could maybe scry with eggs by the patterns in the shells when they break, or the yolks when they pop. Have fun and be creative! Happy Equinox! If you want help writing an egg spell feel free to message me!